Sean Englund first contacted Billy Houpt, Peninsula SPCA Operations and Petting Zoo Manager, about two months ago. Sean wanted to know if he could create an Eagle Scout Project to benefit the Peninsula SPCA and already knew what he wanted to do — he wanted to build dog beds. Without any hesitation, Billy let him know that he had the support of the Peninsula SPCA and go ahead and move forward with his project. Sean is from Troop 94 from Tabb, Virginia. To become an Eagle Scout, part of the requirements dictate that the scout must to plan, develop, and give leadership to others in a service project helpful to any religious institution, any school, or their community, without any help from anyone other than his troop. Sean graciously chose the Peninsula SPCA. He spent a total of about 60 hours planning for this project and gathering the materials, which were all donated. Sean approached Signature Canvas in Hampton, in hopes that they would donate the canvas for the beds, and they did. Once he had canvas, Fast Nails agreed to donate fasteners (to hold the PVC piping together) and the PVC piping was donated by a hair dresser and a construction company. With the help of his fellow troop members, Sean completed the construction of twenty-five beds in about five hours. 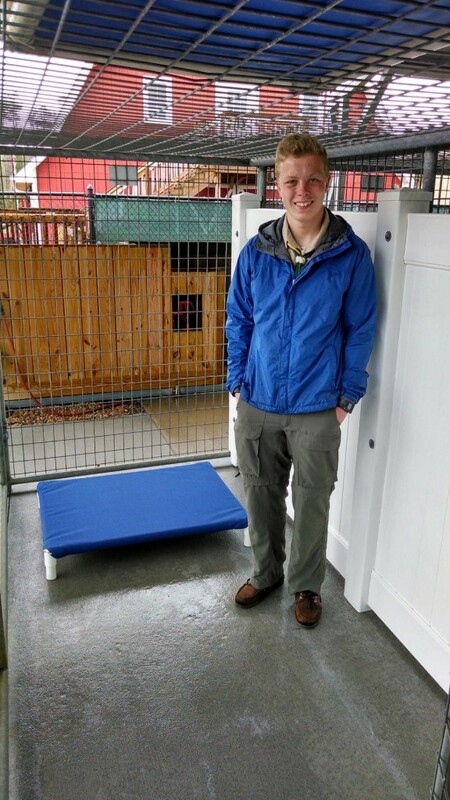 After couple of months and a lot of hard work, Sean presented his completed Eagle Scout Project to the SPCA on Saturday, March 29. His proud parents, his Scout Master, and several other young men from his troop were all in attendance for this great accomplishment. Sean donated twenty-five Kuranda-style dog beds that can be used in the dog runs and the outside kennels. If the Peninsula SPCA purchased these Kuranda dog beds, they would be $57.00 each. Thanks to Sean, this saves the Peninsula SPCA about $1425.00. Sean designed and built these beds according to the specifications of Kuranda. Sean’s outstanding leadership skills have not only saved the Peninsula SPCA nearly $1,500, but they have also positively impacted the lives of homeless animals as they are awaiting their forever homes. Sean’s father let Billy know the reason Sean chose to do his Eagle Scout Project for the Peninsula SPCA– the dog that he and his family adopted from the Peninsula SPCA years ago recently passed away and this was Sean’s way of giving back.